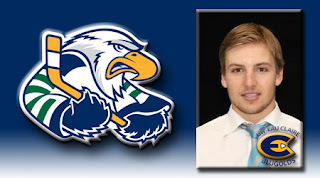 Surrey, BC - The Surrey Eagles Hockey Club is pleased to announce that defenceman Troy Paterson has committed to attend the University of Wisconsin Eau Claire, beginning in the 2013-2014 season. The 20-year-old blue liner was acquired by the Birds from the Cowichan Valley Capitals at the BCHL Trade Deadline in early January, but his year was cut short in just his second game in a Surrey uniform when he suffered a season ending lower body injury. In his final year of junior hockey, Paterson posted four goals and nine assists in 29 games. "We are very excited as an organization to see Troy take the next step in his hockey career," said Eagles Head Coach and GM Matt Erhart. "Unfortunately he only played two games for us this year, but after seeing him play over four years in the BCHL, I know he's very deserving of the opportunity to continue his hockey career at a great program like Wisconsin Eau Claire." The University of Wisconsin Eau Claire is located in the city of Eau Claire. The Blugolds play in the NCAA's Division III Northern Collegiate Hockey Association and are coming off a national championship victory. "They showed a lot of interest in me for an extended period of time," said Paterson of UW-Eau Claire. "Obviously, looking at their history and the success they've had last season and in the past, it was a big contributing factor." Paterson becomes the 12th member of the 2012-2013 Surrey Eagles to commit to play college hockey, joining Devon Toews (Quinnipiac, 2013), Michael Santaguida (Vermont, 2013), Craig Wyszomirski (Merrimack, 2013), Adam Tambellini (North Dakota, 2013), Brady Shaw (Vermont, 2013), Dan O'Keefe (Yale, 2013), Michael Stenerson (Vermont, 2013), Brett Mulcahy (Holy Cross, 2014), Drew Best (Vermont, 2014), Demico Hannoun (Michigan Tech, 2014) and Jordan Klimek (Northern Michigan, 2014). The Eagles would like to congratulate Paterson on his accomplishment.